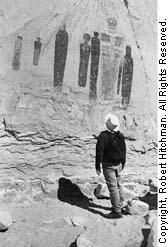 The largest and best panel of pictographs to be found in the Southwest is on the canyon walls of the Great Gallery located in Horseshoe Canyon in the western annex of Canyonlands National Park in Utah. These are some of the most impressive panels of ancient artwork in America. To protect the ancient artwork in Horseshoe Canyon, a small section of the remote canyon was added to Canyonlands National Park in 1971. This detached annex of Canyonlands National Park is located about fifteen miles west of the Island in the Sky–as the crow flies. If you follow the paved highways, it’s a long drive from Moab. If you are planning to visit Capitol Reef National Park or Bryce Canyon, Horseshoe Canyon is on your route. You can enter the Horseshoe Canyon Unit from Highway 24, north of Hanksville, Utah, about fifty miles south of Interstate 70. Turn east on the Horseshoe Canyon Road between mile posts 136 and 137 and drive the well-graded dirt road (dry weather only) about twenty-five miles to a junction. The road is fast and level across a flat, sage-covered plain. Turn left and drive another five miles to a marked right turn to the trailhead at the top of a low hill. On a recent trip to the area, I drove this road with a two-wheel-drive VW camper and spent the night at the top of the trail to get an early morning start for the hike to the Great Gallery. The night sky was very clear and no moon obscured my star trail photos made from the edge of the canyon. There are no city lights and no air pollution out there. There is no fee to use the campground at the trailhead. From the trailhead, it’s a thirty-minute, mile-and-a-half, eight-hundred-foot-descent into the bottom of Horseshoe Canyon. This trail was once an old four-wheel-drive-route and the descent is gradual, not steep. Turn right at the bottom of the trail and follow the sandy wash south. There are many large cottonwood trees growing in the canyon. The trail along the bottom of the canyon is level, well marked with small piles of rocks, and is easy to follow. Stay out of the deep soft sand in the middle of the wash. Listen, as you walk, for the descending notes of the song of the canyon wren. It’s almost two miles to the Great Gallery but there are three other panels along the trail. The first and only panel on the left or east side of the canyon, is called the High Panel and needs a 300mm lens to photograph properly. This is the only place I’ve ever seen a pictograph of a man with bird’s wings. The next two panels, the Horseshoe Shelter and the Alcove Site, are lower and can be photographed with a normal lens. When you round the final bend in the canyon and spot the huge red figures on the canyon wall called the Great Gallery, you will know that you have arrived in a special place. The early morning sun strikes this wall first and illuminates dozens of the red ocher images. The tallest figure stands over twelve feet tall beside a small dog. Other figures are wearing wildly-patterned ceremonial dress but have no arms and no legs. Strange hollow eyes and skull-like heads add a very mysterious feeling to this place. Intermixed with the large figures are smaller hunting scenes, animals, and strange patterns. 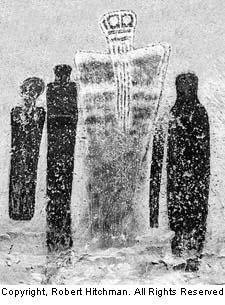 The large pictographs, the painted figures are dated back to the Late Archaic Period, from 2000-1000 B.C. The figures are almost thirty feet above the canyon bottom but several trails lead up onto the pile of talus at the base of the panel. While you are hiking and exploring this isolated desert canyon, you may feel that you are the first human to walk here. The truth is that people have been living in these canyons for well over ten thousand years. Later styles are called Fremont and Anasazi styles. Petroglyphs and pictographs depicting the horse were done after A.D. 1540 when the Spanish arrived and reintroduced horses to the Americas. If you climb up close to the wall, you can see that many of the figures were painted on the canyon wall and then decorated with patterns chipped into the stone surface. They are both pictographs and petroglyphs. You can photograph single figures or small groups of the figures from a distance with a 200-300mm lens. If you climb up onto the rocks, almost to the base of the panels, you will be much closer and can use a normal or even a wide-angle lens to frame the same images. However, when you move in close, the bottoms of the figures are still above your head and you will be looking upward at a steep angle. There will be more distortion in your photographs. On my morning visits to the Great Gallery, I have never encountered another person there. The National Park Service provides a ranger-guided hike to the panels that leaves the trailhead at 9 A.M. The panels of the Great Gallery face the southeast and are in the shade in the afternoon. Bring an 81A filter to warm up the afternoon’s blue shadows and polarizing filter to eliminate the sun’s glare on the stone in the morning. Nearby Goblin Valley State Park is definitely worth a visit. The park entrance on Highway 24 is just about a mile north of the entrance into the Horseshoe Canyon District. Goblin Valley is west of Highway 24 and Horseshoe Canyon is east of Highway 24. Goblin Valley’s shallow basin, filled with thousands of eroded sandstone pillars, is especially fascinating at sunset. Set up your camera with a wide-angle lens on the rim of the basin or walk down into the “goblins.” Ask the ranger for directions to the nearby pictograph panel that includes a human figure holding a snake. I prefer to do my travel, explorations, and photography during the off-season. Winter on the desert often brings a blanket of snow to red rock canyons and a white dusting across the sage brush can make a great photograph. Long hikes are easier when the weather is cool and there are no crowds in your way. From mid-March, through April and May, the wildflowers and cactus begin to bloom and temperatures are usually perfect. Spring is an excellent time to visit Canyonlands. June is getting warmer but is probably the driest month of the year. When the weather warms up, from late May through the summer, gnats and biting flies can be a problem, especially when they get in your hair and bite behind your ears. Carry insect repellent for this hike. August is the wettest month. Late September, October, and the first half of November also bring good weather to southeastern Utah. Motels and other facilities around Moab are kept busy from mid-March through late October. If you are not a camper and prefer to find a nearby motel, try the Whispering Sands Motel in Hanksville, Utah. (801) 542-3238. If you are traveling Interstate 70 between Moab and the Horseshoe Canyon section of the park, you may need to find a restaurant that is open in the early morning or late in the evening. Take the Green River Junction exit off Interstate 70. The Tamarisk Restaurant serves good food and has a great view of the Green River. Across the street is the Green River Visitor Center that’s worth a stop for the John Wesley Powell Expedition display.